Gorgeous pieces reflecting Art Deco. Plus, read more for the giveaway! 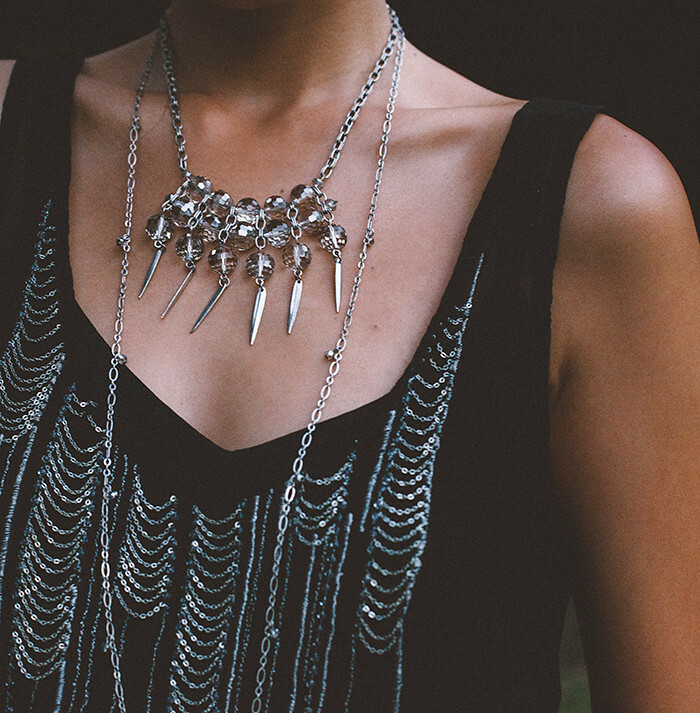 Grayling bib necklace and long necklace. Plenty by Tracy Reese dress. Valentino shoes. The start of fall and the holidays is perpetually a mini revival of Art Deco in my wardrobe. I love the glitz, the embellishments, the swingy dresses. The jazz age is such a romantic and energetic era that is a favorite to pull style cues from. 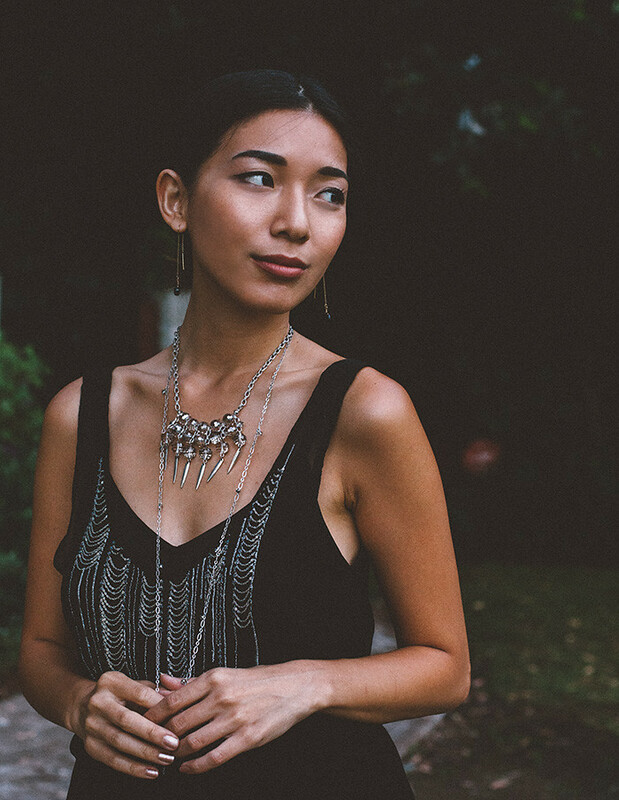 This little black dress from Plenty by Tracy Reese is a perfect backdrop for accessorizing; the dainty chain embellishments bring out the necklaces I'm wearing from Grayling, which are just aligned with my Art Nouveau inspiration. The bib necklace is a lovely statement piece, essential for the holidays, and I find it perfectly accented with the wrap necklace as a one-piece or wrapped around twice. Grayling Jewelry is a new jewelry destination with pieces handmade in Portland, Oregon and I'm happy to have discovered the brand just in time for the holidays. Winner will be picked on October 22. Good luck and thank you for entering! Wow, I'm absolutely in love with Grayling. Thank you so much for introducing me to them. Their pieces are perfect for me and my style. I love the two you're wearing but I also really love the Daphne Statement Necklace - Silver and the Etta Convertible Necklace - Silver! The silver details really give the black dress an extra 'wow' factor. Love the look girl! I a gold person. I absolutely love jewellery in gold. My fav would be the andromeda bracelet and Bali Earrings. They are so beautiful. Thank you for such an awesome giveaway! I really love wearing both gold and silver pieces because you can change things up but still add that extra something. My favorites right now of the Grayling collection would be the Prism Necklace in Gunmetal and the Biscayne Necklace in Brass. Both are beautiful pieces and are simple yet completely awesome so I am happy that there is such an amazing giveaway to get some of the Grayling jewelry! My favorite piece from the website is the brass curvette necklace! It is so simple yet so chic. I hope to win this beautiful piece. I'm in love with it. wow! as always you have amazing choices in style! these two necklaces are amazing! I really, really LOVE the bib necklace but have a need for the long necklace. Thanks for the chance at winning some great pieces! I like the PRISM NECKLACE – SILVER! The CHOCOLATE IVY NECKLACE - ROSE COPPER is really quite something. The centerpiece is really quite something. I really love the DINAH CONVERTIBLE NECKLACE! Ohh! This is way too difficult! I am in love with Bali Charm Necklace and the Prism Y Necklace! My favorite is the Crystalline Convertible Necklace in mixed metals. I love love love the Nova Bracelet in black (or gold, or black.. or - you see where this is going :)), and equally love the Menara Convertible Necklace. They're all ridiculously gorgeous. Thanks for pointing me to this brand!!! I love the Willow Layered necklace in silver - I am obsessed with chokers at the minute, but I adore it's long design! It is so minimalist! I also like the Prism Y necklace. crystalline convertable necklace in silver or gold! I love the CHOCOLATE IVY NECKLACE - GOLD. I would chose the Panthera Convertible Necklace. I also really love the Zelda necklace and the white Menara bracelet! I love the White Menara Bracelet. It's just gorgeous! I like the silver Osana Necklace and the silver Etta Earrings. Grayling is wonderful, from their products to their people. I love the Lyra and Prism necklaces!